How Do Teams Create Better Chances? Yesterday I talked about the importance of adding defensive positioning to shot location in trying to determine the actual value of any particular shot. Shots from space or behind the defensive line have a much higher likelihood of becoming a goal than shots that are closely contested. However, shots from space are exactly what most defences are designed to stop. In the modern game, whenever a ball enters the danger zone, there will be multiple defenders who close on the attacker to limit their ability to shoot or to find a teammate with a pass. Thus the question arises: how do the best teams go about creating better chances? 1) Most shots your team takes should be from inside central. But obviously that’s not good enough. Most teams know and practice this principle, and the really successful teams seem to create even better shots than this. You know there are more valuable shots available to you – how do you create them? This is the obvious one that most teams are aware of and use regularly. Breaking out after a corner or set piece and attacking the opponent’s defenders at speed yields better chances than attacking organized defences. In order to exploit this, you need fast players in wide positions, and scoring midfielders to fill the middle on breakouts. You also need players that can pass the ball accurately for the initial break out (often a long ball), and then at speed once the break is on. There’s a theory that Mourinho’s teams have intentionally given up corners over the years, knowing that they have a low risk of leading to an opponent goal, while yielding counterattack opportunities. The complicating factor in this is that the better the players on your team, the less often you get good chances to counter. This is the Barcelona style of things, and to a certain extent what Fergie has quietly been doing in recent times at Manchester United. If you watch Barcelona enough, you can see that they have run patterns the attacking players perform, a bit like wide receivers in American football. Their central midfielders plus Messi and Alves act a bit like Quarterbacks in that they get the ball, check for whether any of the runs are on, then recycle to other central players as necessary. This lets Barcelona keep possession of the ball while constantly probing even organized defences for a moment of weakness. United actually do it slightly differently in that they seem to play almost a post-up game with front attackers in the box. There’s an entry pass to this player, who acts as a wall to either the initial passer making a run, or a secondary runner off of a wide angle. Obviously if their own defender drops to play the pass, then the wall player can control the pass and turn for a shot as well. It’s different from the Barcelona system, but still damned effective at creating space + chances inside the box. 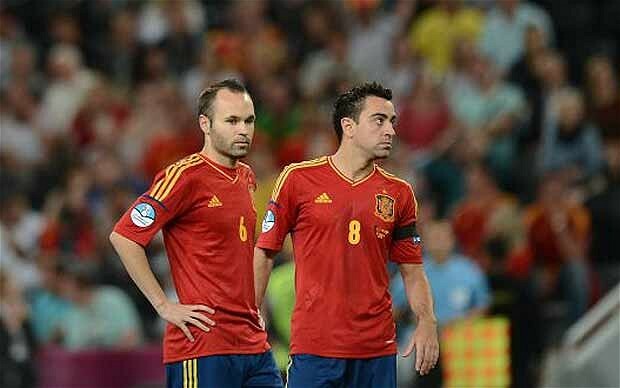 The interesting connection between these two teams is that they have had a consistent core of players, including one incredible forward (Rooney, Messi) and some brilliant passing midfielders (Xavi, Busquets, Iniesta and Scholes, Carrick, Giggs, Nani). I’m reasonably certain that having player personnel there for the long-term is an important aspect of making each of these systems work. (Imagine trying to run an NFL offense with a new QB every season, and you can see the importance of personnel consistency.) It also explains why it is often very difficult for Barcelona to buy and integrate new players quickly. This is something else Barcelona and Manchester United do all the time, but one that every other team aspires to. Through balls are balls that release a player in behind the defense and typically put them 1 vs. 1 against the goalkeeper. You can increase the rate these are created systemically, but you need players with the vision and skill to pull them off. Even the best players in the world only seem to average 1 successful throughball per game. Obviously the other way to get past the defense is to beat your man and run into open space. This gets more difficult against a set, organized defense where beating just one man means you immediately run into his help defender, something the best teams tend to face. It also happens more on the flanks of the pitch, which are areas that lead to low percentage shots. Thus if you have great dribblers who beat people on the flanks, you still aren’t going to get great goalscoring chances unless you have central runners at near and far post to pass to. Dribbling seems like an individual skill, but creating goals from it requires a system that accommodates it well. This is one that we hear about more and more, and the utility of this approach is fairly obvious. Much like counter-attacks, being able to steal the ball away when the opposing team feels possession is safe, lets you attack into a less-prepared defense with fewer defenders around to deal with because they are usually getting into position to attack. Consistently pressuring the ball in this fashion can yield huge dividends, but it is taxing on your players, and can’t be maintained for the entire match. Most managers pick certain periods to employ this tactic heavily, and then mix it up throughout the rest of the match. Obviously most of these approaches need the right personnel to pull them off, but at least a few of them are available to any team at the top levels of the game. The impressive part comes when you look at Bayern Munich and realize they have the personnel and the fitness to employ any and all of these when they need them. They already play an intricate passing and possession game with players who are a) extremely skilled at throughballs and b) exceptional dribblers at both wing forward positions. They counter-attack regularly, and Kroos, Muller, and Schweinsteiger are outstanding at filling the center of the box with runs from midfield, giving their forwards options to pass to when they beat their men. They will also press (though not to the same extent as Dortmund do), limiting opposition options for short passes, and occasionally getting a quick reversal of possession to go on the attack again. It’s not enough to simply create a lot of shots in the modern game. In order to win the biggest leagues and the Champions League, offensive systems now need to overcome packed, organized defences nearly every week of the season, and they need to be efficient at converting the chances they create. In order to create better offensive chances, teams need to have the ability to either attack fewer defenders, defences on the move, or develop interesting ways of moving defenders around in the penalty box until someone loses concentration for a moment, at which point they strike. Teams have developed a variety of ways to deal with improved defense, some (like Barcelona and Manchester United) far better than others, but employing those systems may have a high cost in terms of player skill and/or personnel consistency. This also goes a little way toward explaining how some math models like TSR have difficulty analysing teams who create fewer chances, but whose chances have a higher probability of yielding goals. Last season Liverpool created the most shots per game in Europe, but they were incredibly inefficient at converting them into goals. With better personnel in place and an additional summer to learn how to exploit Brendan Rodger’s adapted passenaccio, can they once again compete for the Champions League? What of Arsenal, who not only (finally) seem to be in the financial position of no longer selling their best players, but may also start buying star players again? Wenger’s offensive system was hailed as brilliant before Barcelona took some of the sheen off – can they return to a high level of shot creation that is also efficient and maybe compete for a league title? This summer sees a massive amount of change, all around Europe – perhaps the most among the big clubs that I can ever remember. In the midst of all this, it will be interesting to see how teams that are settled and already employ advanced attacking techniques (like Liverpool and Arsenal) fare versus the clubs that are adjusting to the demands of new management (ManU, Chelsea, Manchester City, Bayern).